This new Charmed E-book Series takes place between Seasons 9 & 10 of the comic books. All e-books will be written by Paul Ruditis. Having won the ultimate battle against the forces of darkness, Piper, Phoebe, and Paige—The Charmed Ones—are looking forward to a hard-earned, peaceful future. But when Phoebe’s former love, Cole, returns from the dead and the sisters are reunited with Prue, now imprisoned at the magical convergence between the realms, a dangerous new threat emerges. As seemingly normal mortals violently steal the magic of witches, The Charmed Ones must shield their kind while protecting themselves from a modern-day witch hunt. Charmed: The War on Witches continues the story of the Halliwell witches, picking up where the hit television series, Charmed, left off. With only the Book of Shadows to guide them, the Halliwell sisters are the fulfillment of their ancestor Melinda Warren’s prophecy that three sisters descending from her line would become the most powerful witches of all time. As The Charmed Ones, the sisters use the Power of Three to protect the innocent and banish evil from the Earthly realm. When Piper, Phoebe, and Paige undo a spell that turned a local politician to stone, they little realize the powerful magic behind the hex. As attacks on innocents mount, The Charmed Ones enlist the help of their sister, Prue, confined on the magical Nexus, only to learn that the most heinous of mythical creatures-a gorgon-is to blame. 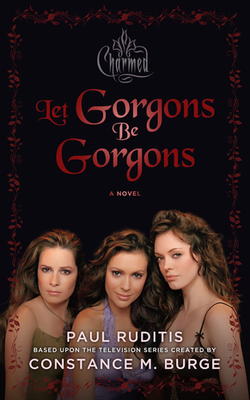 Inspired by the hit televisions series Charmed, the new novel Charmed: Let Gorgons Be Gorgons continues the story of the Halliwell witches. With only the Book of Shadows to guide them, the Halliwell sisters are the fulfillment of their ancestor Melinda Warren’s prophecy that three sisters descendin from her line would become the most powerful witches of all time. The sisters use the Power of Three to protect the innocent and banish evil from the Earthly realm.